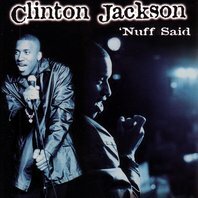 Listen to "'Nuff Said" on your iOS and Android device. Clinton Jackson is a rarity: a comedian who works clean. A fighter against stereotypes, he has been compared to a young Bill Cosby. His comedy is mostly observational; it's about life, kids. On stage he dances as if he were in a boxing match, delivering material that is as much fun to watch as it is to hear. He is clever and engaging. On `Nuff Said`, Clinton reflects on life in America today. We are privy to his personal opinions on everything from the "San Francisco scene", to Star Wars, to the "un(i)-bomber", to feminine "mood changes". His comical observations will make you see life in a different light, and a welcome change it is.